Dr. Drew E. Schnitt is a board-certified plastic and reconstructive surgeon in Delray Beach, FL, with special skills for complex cosmetic and reconstructive plastic surgeries of the face, breast, and body. He is an Adjunct Faculty member at the Cleveland Clinic Florida as a Professor in the Plastic Surgery Residency Training program, and an Adjunct Professor at Nova Southeastern University in the Pedodontic Residency Training Program. Internationally recognized for his humanitarian work, Dr. Schnitt has provided his services voluntarily to patients in need of craniofacial and burn reconstructive surgery around the world with Operation Smile. Dr. Schnitt devised two unique techniques in craniofacial and reconstructive surgery including the Las Olas cranial bone contouring technique for difficult craniofacial surgical correction. He also devised the bone anchored ear prosthesis technique providing a better method of prosthetic ear retention. He is a respected plastic surgeon among his peers nationally and internationally as a lecturer, presenter, author, and researcher. Dr. Schnitt is a perfectionist and pays attention to every detail. He has extensive experience with aesthetic surgery procedures and has a long history of performing implant and tissue-based reconstructive breast surgery and performs multiple types of microsurgical free flaps, including Free TRAM DIEP flaps, and many other types of free tissue transfers. Dr. Schnitt also has extensive experience with pedicle-based flaps. He has a genuine concern for the safety and well-being of his patients and works to provide the best possible outcome. Dr. Schnitt's work on children and complex deformities in pediatric and adult reconstructive surgery adds perspective and a critical skill set enhancing his cosmetic surgery outcomes. Schnitt, D. M.D., Trainer, D. An Innovative Method of Osseointegrated Custom Auricular Prosthesis Retention. Maxillofacial Prosthetist. Hwee, Yin Kan M.D., Schnitt, D. M.D., Trainer, D. A Novel Approach to Osseointegrated Auricular Prosthesis Retention. Southeastern Society of Plastic and Reconstructive Surgery. Weaver, T. MSIII, McDonald, C.L. MSIII, Pepe, A. M.D. Schnitt, D. M.D. Penetrating Flare Gun Injury of the Lower Extremity in a 4-Year-Old Male: A Case Report. Schnitt, D. M.D., Heger, I. M.D. Endoscopic Treatment of Metopic Synostosis: The "Double Sail" Technique. Schnitt, D. M.D., Braun, T. PhD. Pushback Palatoplasty: A Viable Treatment for Velopharyngeal Insufficiency. David, J.D., M.D., Anderson, P.J. M.D., Schnitt, D. M.D., Sells, R. L.A.C.S.T., M.S.P.A., Nugent, M. M.S., F.R.A.C.D.S. From Birth to Maturity – A Group of Patients Who Have Completed Their Protocol Management for Isolated Cleft Palate: Part II. Plastic and Reconstructive Surgery. 117:2, 2006. Schnitt, D. M.D., Agir, H. David, J.D., M.D. From Birth to Maturity – A Group of Patients Who Have Completed Their Protocol Management for Unilateral Cleft Lip and Palate: Part I. FRAC Plastic and Reconstructive Surgery. 113: 3, 2004. Schnitt, D. M.D. "An Army of Kindness." Presented at LifeNet Health. Virginia Beach, VA, February 23, 2017. Schnitt, D. M.D. "Cleft Palate Surgery Question and Answer Live Surgery Demonstration." Presented at the Operation Smile NEXT Conference. Norfolk, VA, May 23, 2016. Schnitt, D. M.D. "Rhinoplasty and Cleft Rhinoplasty." Presented at the Board Review for Residents. Grand Rounds Cleveland Clinic/Memorial Regional Hospital. Hollywood, FL, August 25, 2015. Schnitt, D. M.D. "Cleft Lip and Palate." Presented at the Board Review for Residents Cleveland Clinic Florida/Memorial Regional Hospital. Hollywood, FL, July 14, 2015. Schnitt, D. M.D. "Cleft Lip and Palate – Anatomy, Embryology, Epidemiology & Surgery." Presented at the Nova Southeastern University. April 17, 2015. Schnitt, D. M.D. "Use of the FM Wand in Plastic and Reconstructive Surgery." Presented at the Cleveland Clinic Memorial Plastic Surgery Journal Club. August 25, 2014. Schnitt, D. M.D. "The Sustainable Delivery of Healthcare in Developing Nations” Presented at the Florida Cleft Palate – Craniofacial Association Annual Meeting. Orlando, FL, January 2013. Trainer, D., Schnitt, D. M.D. "A Novel Approach to Osseointegrated Auricular Prosthesis Retention." Presented at the Florida Society of Otolaryngology - Head and Neck Surgery Florida Society of Facial Plastic and Reconstructive Surgery. Boca Raton, FL, November 15 – 17, 2013. Schnitt, D. M.D. "Challenges of Cleft Care." Moderator at the International Cleft and Craniofacial Conference. Guwahati, India, November 10, 2013. Schnitt, D. M.D. "Sustainable Partnerships Through Volunteerism." Guest Speaker at the International Cleft and Craniofacial Conference. Guwahati, India, November 10, 2013. Traveling the world to perform humanitarian surgical work, Dr. Schnitt has changed the lives of children with his skills in plastic, cleft and craniofacial surgery. He has given his time and talents to children in need through Operation Smile, Our Chance International for Disaster Relief (Port-au-Prince, Haiti), and Our Chance International Humanitarian Reconstructive Plastic Surgery in Ghana. Dr. Schnitt was awarded the 2017 Humanitarian Award from LifeNet Health. 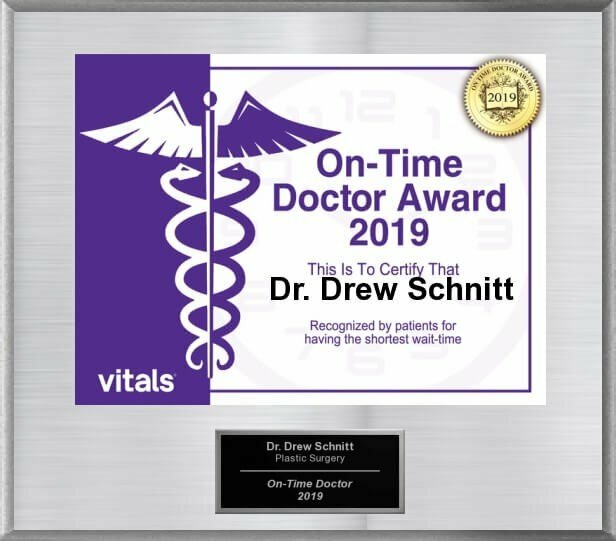 Humanitarian award-winning plastic and reconstructive surgeon, Dr. Drew E. Schnitt, is board certified through the American Board of Plastic Surgery.